In 2012, my mom and I kept seeing the same book pop up in our recommendation list on GoodReads – an upcoming release called The Anatomist’s Wife, by Anna Lee Huber. We mentioned it to each other so many times that I wound up buying a copy for her Christmas gift that year. She really enjoyed it and, naturally, loaned it to me when she was finished. I love historical mysteries, and this series has a really interesting premise – the main character, Lady Kiera Darby, is a widow whose ghastly husband forced her to illustrate his cadaver dissections for an anatomy textbook. After his death, she is considered a freak (or worse) by most of society, and she gets caught up in a murder investigation when her knowledge of human anatomy comes in handy. Different, yes? The series continued with last year’s release of Mortal Arts, which was excellent, and the third book of the series is set to be published on July 1. 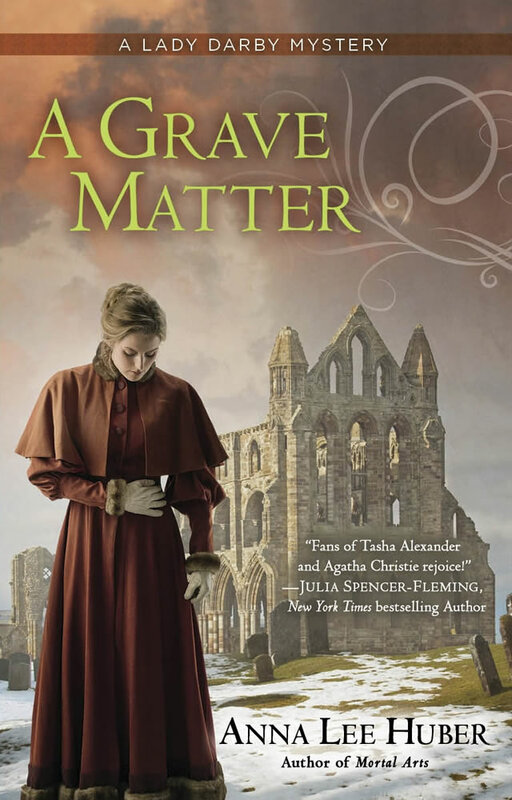 Because Anna is a lovely person, I had an opportunity to read an ARC of A Grave Matter. In A Grave Matter, Kiera is hoping for a restful holiday staying at her childhood home, Blakelaw House, in Scotland. During a ball celebrating the New Year, the traditional festivities are interrupted by the news that a local caretaker at Dryburgh Abbey has been murdered, and the deceased Earl of Buchan’s body stolen from his grave. Body snatchers and their crimes are nothing new in 1830, but this incident seems unique – the Earl has been dead for almost two years, and the robbers left his clothes and valuables undisturbed in his grave. At the request of the current Earl of Buchan, Kiera sends for inquiry agent Sebastian Gage to clear up the matter. But Gage’s arrival brings more questions than answers. This is not the first body to be stolen in this manner, and if this crime matches the others that Gage has been investigating, the Earl of Buchan can expect a ransom note outlining the conditions for the return of his uncle’s bones. Kiera and Gage must sift through conflicting bits of information that lead them to an angry antiques collector who believes a family heirloom was stolen from him, a botched elopement, and a crew of ruthless Edinburgh thieves led by Bonnie Brock. Nothing seems to add up, and Kiera and Gage know they must work quickly to catch the body snatchers before another set of bones is stolen – and before someone else is murdered. This was a great mystery! Sometimes, I can see the end of a book coming, but this one kept me guessing. Anna keeps the suspense and the sense of menace running high. The relationship between Kiera and Gage continues to develop, and there are a handful of new characters that seem like they might become series regulars. Kiera’s big brother Trevor is great – I just wanted to hug him for the majority of the book. Also, Kiera’s new maid Bree seems like she will be good to have around when Kiera gets herself into her usual scrapes. Sometimes there is a tendency with books in a series for the main character to become a static figure – a character that has things happen around them rather than with them. But Anna proves early in A Grave Matter that she’s not finished developing Kiera as a character. The first time Kiera assisted Gage with a murder investigation, she was extremely reluctant to get involved, and only did so to clear her own name as a suspect. The second time, she felt obligated to help Gage investigate since the prime suspect was a close childhood friend. This inquiry is different – Kiera finds herself wanting to be involved rather than feeling pressured. She is coming into her own as an investigator, realizing that she has a talent for the work and even enjoys it. Also in previous books, Kiera finds a refuge from difficult times in her painting. After a terrible accident in the end of Mortal Arts, Kiera has lost her motivation to paint. It’s difficult for her to stand in front of a canvas and not be able to produce the kind of results that she has in the past. Kiera knows she has to work through this if she wants to maintain her talent, but it’s a struggle for her. The final big change for Kiera in this book is her dawning realization that she needs to find a place to call home. In the months following her horrible husband’s death, she has lived with her sister, Alana, and also Trevor for brief periods. While she appreciates their support, she is beginning to see that she can’t shuffle between their homes forever. She needs something more permanent, something that she can call her own. Kiera takes some big steps toward figuring out a direction for her life in this book. I loved that Anna introduced us to some bits of Scottish culture in this book. The story opens at a Hogmanay festival, which is a Scottish New Year’s Eve party, and Anna describes the traditions like first-footing, the bonfire, and the ceilidh dance. Dryburgh Abbey, the location that plays such a big role in this book, is a real place – in a note at the end of the novel, Anna describes a bit about her research there. It’s nice to read a historical fiction book where the details of the setting don’t just feel like wallpaper that is only there to remind you, “Hey, you’re in Scotland in the 1800s!” Instead, Anna’s period detail is woven in throughout the story in a way that feels authentic. If you haven’t read any of this series, I would definitely recommend starting at the beginning. If you have, I think you will really enjoy the direction Anna takes in A Grave Matter. I’m excited to see what she has in store for Kiera in future books! « Happy Belated Release Day, Deanna Raybourn!